With Nationals over and the winners crowned, it is time to take a moment to recognize the top performers in the Women’s Division this season. While the talent of the division reaches far beyond short lists, the Club Awards are meant to honor those players who put together what we believe to be the best seasons in the Women’s game this year. Manuela Cardenas has every possible defensive and offensive tool you’d hope to see in an ultimate player, but perhaps her greatest talent is exceeding the expectations placed upon her. We knew Cardenas was going to be a pivotal piece in Molly Brown’s system this year; what we didn’t account for is how quickly she proved to be Molly Brown’s best offensive weapon at Nationals. Trying to pin down Manuela on offense was like trying to catch lightning in a bottle. She was explosive and a menace with the disc in hand. It was her performance that almost brought Molly Brown to a comeback victory in the semifinals against Brute Squad. In a game where Molly Brown scored 11 points, Manuela assisted on five of those. It’s unclear how sustainable Manuela’s career is with Molly Brown, but if it proves to be this impressive each year, there’s no reason to stop any time soon. Schwa’s Nationals run was one of the surprises of the season. Two upset wins in pool play saw them make prequarters, where they lost by one point, but they also went undefeated in consolation play to qualify for the Pro Flight. None of those wins happen without Hammond. She led the club in goals with 14 — five better than any of her teammates — and tied for the lead in assists with 15. 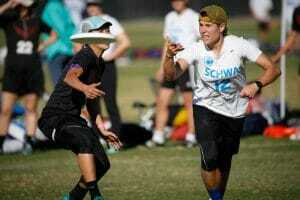 Hammond was the spark plug for Schwa this year and an absolute wrecking ball to opponents’ defense. Her high energy level of play and unbreakable confidence set the tone for Schwa on the field, and her production simply made her one of the best players in the division this year. 2018 was one of the best seasons of Sinicrope’s career. There’s no denying that Brute Squad has built their identity on the defensive side of the disc, but Sinicrope was the driving force behind the team having its best season offensively in years. She was equally comfortable as a metronomic presence helping the Brute offense work the disc down the field as she was at hucking when they needed a quick score. Brute Squad’s offense wasn’t as deep as their primary championship rivals, but were still a point away from winning the championship; Sinicrope was a huge part of that. She took on a level of responsibility that many teams split among a few players, and her level of play this year felt like it matched that of a few players, too. Weatherford has fashioned herself into one of the best pure handlers in the division and the driving force of the Riot offense. She’s adept with the disc in her hands, able to use her unpredictable throwing motions to baffle marks and poaches. Her field vision is elite, allowing her to accurately anticipate play development and offensive advantages, even at the speed of high-level club. She led Seattle in assists at Nationals with 13. Along with Paige Soper, her ability to manage a high volume of touches and difficult throws will infrequent turnovers was vital to Riot’s success; the duo recorded 59 combined touches (first and second on the team) against a predatory Fury defense in the semifinals without a turnover. On the other side the disc, Weatherford’s game IQ also makes her a furtive defensive presence. Generally the depth of Riot’s roster generally makes it difficult to pick out incredible individual performances, but Kelly Johnson transcended that notion this season with one of the most well-rounded performances of any player this year. Despite being our Defensive Player of the Year, Johnson was just as efficient and deadly on offense after causing the turn. At Nationals, she led Riot in blocks and was tied for second in both assists and goals. No player seemed more determined to prove Riot’s dominance than Johnson. Her killer instinct in each and every game brought Riot within one point of making it to the final. While it’s hard to say what more Johnson could do for her team, if there’s a player that could find a way to improve more still, it’d be Vegas. While most of the All-Club is spent discussing in glowing terms the wonderful talents of the division–as it should be, it’s a celebration–I have to ask the question: did Claire Chastain have a down year? While her Nationals numbers don’t jump off the page, last year’s didn’t either, and she landed the Player of the Year award. In San Diego, her 10 assists accounted for 12.6% of her team’s scores, actually up from 10.2% in 2017. Where she saw a dip was in goals, only scoring one this time around, compared with eight last year. What changed wasn’t Chastain’s talent or efficiency, but rather the amount of weight thrust upon her shoulders. Offensive Player of the Year Runner-up Manuela Cardenas filled a lot Chastain’s roles, on both sides of the disc. Alika Johnston, Stacy Gaskill, Allysha Dixon, and Liz Kaloupek were all new additions getting in on the offensive act. Chastain also missed some games this season. But when she was there, she was still one of the game’s most influential players, displaying the gravity, aggressiveness, and impact that she’s known for. Rounding out our All-Club second team was one of the regular season’s most imposing players, Jenny Wei. It speaks to her raw talent that we consider her Nationals performance to be slightly disappointing, considering that she finished with 11 goals, 17 assists, and 3 blocks. If anything, those gaudy numbers might even be a drop-off from the productive season Wei has had in 2018. In fact, in 2018 –with Wei leading the charge– Nationals was the first tournament where Phoenix did not make it to semis or higher. Time and again, Wei’s teammates would look to her to save them from a difficult situations and it paid off more often than not. Her aerial abilities are well-documented and she can make even the toughest throw seem effortless. Even though it was clear that the teams at Nationals had gameplanned to shut down Wei, she still found ways to get open and keep Phoenix rolling. It’s no longer enough to say that we need to keep an eye on Wei, she’s now appointment viewing. 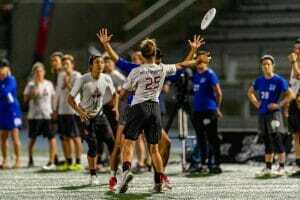 Comments on "Ultiworld’s All-Club 2018: 2nd Team (Women’s), Presented By Greenbackr"